OBAMA, NOSTRADAMUS & JEANE DIXON: FRANCE 02: PARIS DEVASTATED & 3 WARNINGS OF ST. JOHN BOSCO. FRANCE 02: PARIS DEVASTATED & 3 WARNINGS OF ST. JOHN BOSCO. + St. John Bosco had a dream about France & Paris and a great military leader who would protect the Pope. NOSTRADAMUS: PARIS & "RAPIS" DEVASTATED ? + SAINT JOHN BOSCO was an Italian priest who dedicated his life to educate boys, to lead young men to a good Christian life, to teach them virtues and trades. He was a miracle worker, healer, tireless worker and spiritual father to poor boys. The saint is the founder of Salesian Order who died in 1888. Through out his life, he had many profound mystical dreams which helped to direct his steps and some also gave prophetic meanings to the future or our century. + At nine years old, a dream he never forgot, he revealed his vocation. Later in all critical periods of his life, a vision of heaven he always said the way to follow. + So many miracles made ​​to be entrusted to Don Bosco, the Pope canonized him when they had just spent forty-six years of his death (in 1934) and declared him patron of those who spread good reads and "Father and Teacher of Youth ". HE WROTE: "On the vigil of the Epiphany of this year, 1870, all material things in my room disappeared, and I found myself contemplating supernatural matters. It was only a matter of an instant, but I saw a great deal. Although what I witnessed was sensibly present, I find it extremely difficult to communicate it to others intelligibly, as one may realize by what follows. This is the Word of God in human parlance:"
"War will come from the south, peace from the north." "The laws of France no longer recognize the Creator. The Creator will reveal Himself by visiting her three times with the scourge of His wrath. 1) The first time He will destroy her pride by defeat, pillage, and destruction of crops, cattle, and men. 3) "On My third visit, you shall fall under the foreign yoke. From afar your enemies will see your palaces in flames, your home in ruins, soaked in the blood of your heroes who are no more. "But behold, A GREAT WARRIOR from the north appears, a banner in his right hand, his arm bearing this inscription: 'IRRESISTIBLE IS THE HAND OF THE LORD´. At that moment the VENERABLE OLD MAN OF ROME went forward to meet him, wielding a flaming torch. The banner then grew larger and its blackness became white as snow; in its center stood out the name of the ALMIGHTY in golden letters. "The warrior and his followers bowed profoundly to the VENERABLE OLD MAN and joined hands with him." 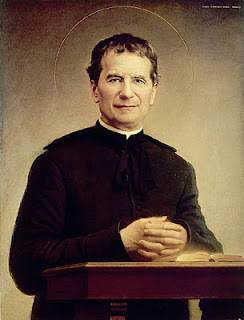 + St. John Bosco and his companions thought that the dream was referring to the Franco-Prussian (1870) war and the dispute to put someone on the throne of Spain, and later to the Carlist Wars. "Proclamation of the German Empire, January 18, 1871", by Anton von Werner, at the Palace of Versailles (is a royal château in Versailles in the Île-de-France, region of France ;today, however, it is a suburb of Paris, some 20 kilometres southwest of the French capital), 1877. The History has proved them wrong because no German troops occupied Paris until 1940 and the Pantheon has not been damaged until now. 1) THE FIRST WARNING concerns the fall of France (1940). Hitler's army defeated the French troops and made ​​France a puppet under the command of Marshall Petain: Because of his outstanding military leadership in World War I, particularly during the Battle of Verdun, he was viewed as a national hero in France . + Is the Vichy France, the Vichy Regime, the Vichy Government, or simply Vichy are common terms used to describe the government of France which collaborated with the Axis powers during the Second World War. Officially, it called itself the French State (État Français) and was headed by Marshall Philippe Pétain, who proclaimed the government following the Allied defeat in the Battle of France. It lasted from July 1940 to August 1944. +The legitimacy of Vichy France and Pétain's leadership was constantly challenged by the exiled General Charles de Gaulle, who claimed to represent the legitimacy and continuity of the French government. 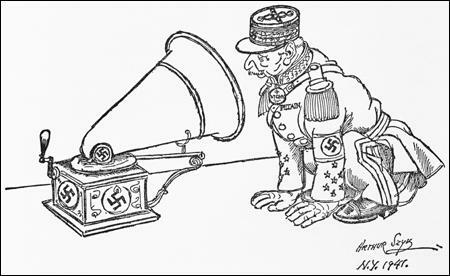 Public opinion turned against the Vichy regime and the occupying German forces over time and resistance to them increased. Following the Allied invasion of France in June 1944, de Gaulle proclaimed the Provisional Government of the French Republic (GPRF). The cartoon shown here from 1941 is of Marshall Petain, the Nazi figurehead of Vichy, France, who had surrender much of his country to the Nazi regime in Germany, indicated by the swastikas on the phonograph. 2) THE SECOND ANNOUNCEMENT to France refers to the future. The danger comes from Babylon (city or region of Mesopotamia). The French government will fall, the Pantheon will be destroyed and the people will be terrified and hungry. + The War will come from the South and the peace from the North. + A great military leader will defeat the invaders and is very powerful. + The military leader will help the Pope in his work. Opening lines of the letter to Henry, written by Nostradamus, June 27, 1558, in Salon de Provence (France). 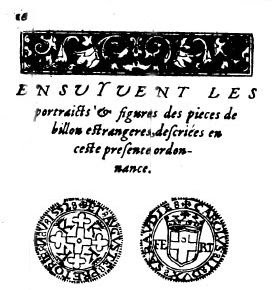 "Faciebat Michaël Nostradamus Salonae Petrae Prouinciae". B ..... & NOSTRADAMUS WROTE ABOUT SOMEBODY MIGTHY. 01- ABOUT THE VERY POWERFUL HENRY. Et du seul tiltre vigueur fort contenté. And with the sole title of VERY VIGOROUS will he be quite satisfied. + It is obvious, none so powerful as he will be. 02- ABOUT HIS SUPPORTS THE CATHOLIC CHURCH & RESTORES HIS HONOR. Turning the Church to its pristine pre-eminence. + From the South (via Spain or Italy) come the Arabs and the mighty French King will come from the North (specifically from lyon) to Rome. & NOSTRADAMUS WROTE ABOUT PARIS. Lyon par change sera mel consolé. Lyon will be poorly consoled for the change. 1- Tricast: Perhaps Tricastin (Provenca, France) and Nuclear site. 03- PARIS ESCAPE, AVIGNON & LYON DEFENSE. ( and a curious mathematical problem). 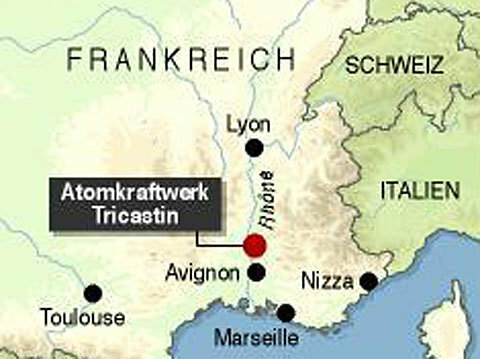 Depuis six cens et sept vingts trois pars. After six hundreds and seven twenty three parts (or pairs). (or "After 600 & 7 23 parts (or pairs)"). ???? + Except Paris, all cities mentioned by Nostradamus belong south of France. + I guess "BRIDGE" means "exit door" or "escape" , and the word "WALL" can mean "obstacle" or "limits". From MONTAUBAN, BEZIERS, MONTPELLIER, NIMES & AVIGNON, to LYON (the wall). +The people of Paris will flee from this great city for some awful reason. (perhaps related to the nuclear power of Tricastin and the fury of Anibal). 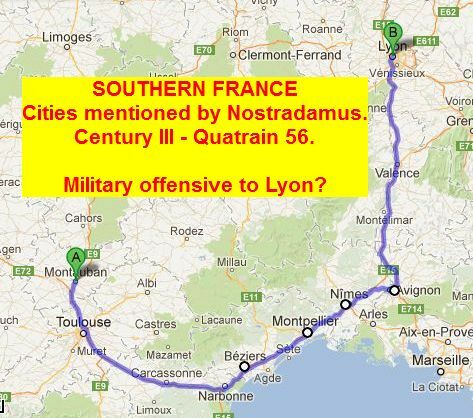 Almost simultaneously, in late March from southern France a military offensive will reach Lyon and nothing else. 1+ MUNISMES Somebody say it means COIN from the latin word NUMISMA -ATIS or GOD from the latin word NUMEN -INIS but I think it is a word derived from the Latin word MUNIMEN -INIS: Fortification, trench or any work of military defense. "Thus, in the copy of Utrecht (1557 edition) .... and Budapest version gives PEACE instead of FAIX, but the Budapest copy introduces a new point after. The Benoist Rigaud editions of 1568 accentuates the last adjectives of the 2 and 4 verse: descriées and empireés". + The word PEACE is meaningless to me. "Le quatrain 23 de la centurie VI et la critique des méthodes dites rationalistes" by Patrice Guinard. 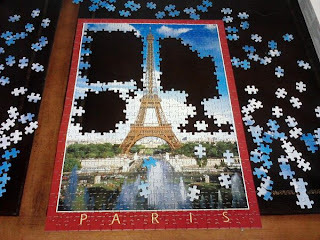 + 4 RAPIS Possible anagram of Paris, France. An anagram is a type of word play, the result of rearranging the letters of a word or phrase to produce a new word or phrase, using all the original letters exactly once. + Crisis of the fundamental laws of France. + The kingdom has lost its reason for being and the defense of its existence and citizens are revolted against their king. The weight of this new fact will make the fundamental laws of the country getting worse. 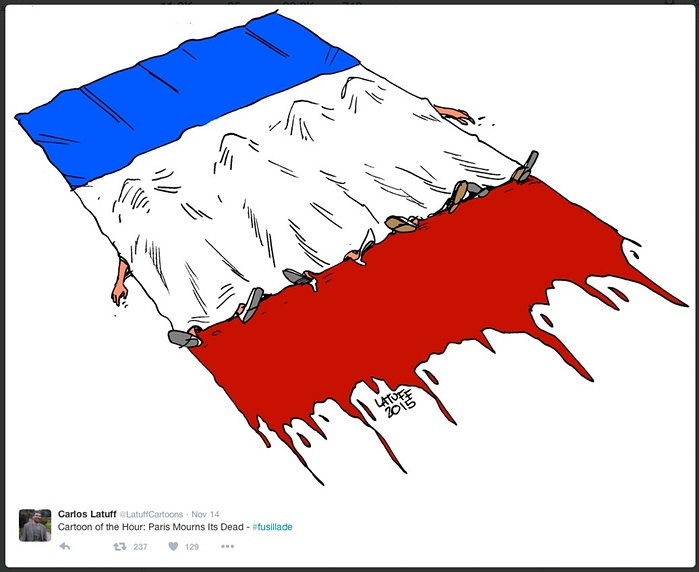 Paris, capital of France, never will be seen in such a difficult situation. + And then I hope it is restored monarchy in France, in a legitimate heir. This fact makes possible the second warning of Don Bosco on the prostitute of Babylon, ancient city of Babylon or region. The French republic and its leaders will be defeated, and demoralized and hungry people will be coming. The solution is in the next notice, the destruction of Paris and the new and powerful leader. ........ And now to explain the return of the powerful king. The birth of ISIS in Mesopotamia makes credible the threat of the prostitute of Babylon ( from Mesopotamia), and enables connection with the threat of Mesopotamia as told Nostradamus in his quatrains.